A Destination Maternity® gift card is the perfect gift for mom-to-be. 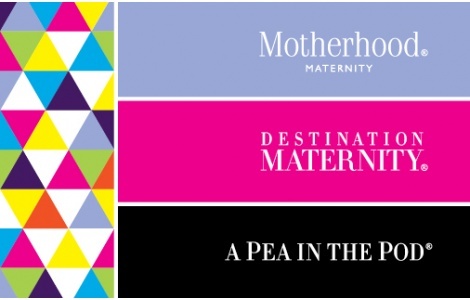 Destination Maternity® is home to the world’s leading maternity brands, Motherhood Maternity® and A Pea in the Pod®. From style to service, they offer the largest collection of maternity fashion, accessories and nursing products to help every expectant woman put her best bump forward. Once activated, this card is redeemable at A Pea in the Pod®, Motherhood Maternity®, Destination Maternity®, and Motherhood Maternity® Outlet store locations, or online at motherhood.com, apeainthepod.com, and destinationmaternity.com. For balance, visit destinationmaternity.com/giftcards or one of our locations. Once activated, this card is redeemable at Motherhood Maternity®, A Pea in the Pod®, Destination Maternity®, and Motherhood Maternity® Outlet store locations, or online at motherhood.com, apeainthepod.com, and destinationmaternity.com. This card may not be redeemed in any department store where our product is sold. Lost, stolen or damaged cards will not be replaced nor can cards be redeemed for cash, except as required by law. If ordering online, please save this card in case of product return. Card retains unused balance. For balance, visit destinationmaternity.com/giftcards or one of our locations. Issued by Destination Maternity Corporation®. All rights reserved.